While driving around town to check on pets this past month, I have seen an alarming number of pets hanging out of drivers’ side windows on their parents’ laps! It struck me as amazing at how unaware the parents were of how VERY dangerous this is, so I thought it might be a great topic for this month’s article. Do you know that 84% of pet parents drive with their pets in the car at some point? With these high statistics, the following advice can potentially save many pets’ lives as well as educate the public. So get ready…and please send this to everyone you know who is a concerned pet parent! Do not let your pets hang out the window! Something could fly into their eyes. If you stop short, they could seriously injure their necks. They could be startled or excited by something they see outside the window and attempt to jump out. Whether or not they are successful or any of these things occur, this could lead to a distraction to YOU and cause an accident! 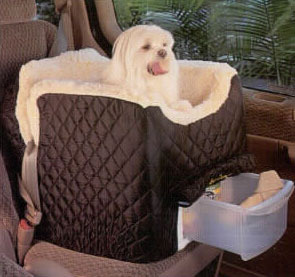 Pets, like children, should ride in the BACK SEAT because if a front-seat airbag is deployed, it could KILL your pet! While in the back seat, they should wear a harness attached to the seat belt. Never attach a collar to the seatbelt; this could seriously injure your pet’s neck. This helps keep them in a safe area of the car; and if you are ever in an accident, it prevents them from running into traffic in a panic, possibly creating even more danger. Okay, Danielle, so how should I drive safely with my pet? Remember to always keep them in the back seat with a harness attached to the seat belt, and consider using a pet car seat. Consider securing your pet in the back or your car or SUV behind a gate. Make sure they go to the bathroom before getting in the car. Open the window so they can breathe in the air, but let the air come to them, not them to the air! This just in! Farmers Insurance is introducing a Household Pet endorsement for all Auto policies effective 06/01/08. This coverage will pay up to $600.00 for a pet injured or killed in an accident or in a total-theft loss. This endorsement will automatically apply to all current customers of Farmers; for new customers, there will be no extra cost. Contact Joyce Seide at Farmers Insurance, (480) 443-1952, for more information.